As the saga of George Lucas's proposed Museum of Narrative Art continues, it appears the famed director and passionate art collector has at least a few more tricks up his sleeve. The latest was played this week when Lucas released renderings for a museum on Treasure Island that differ wildly from his original Presidio design from 2013. 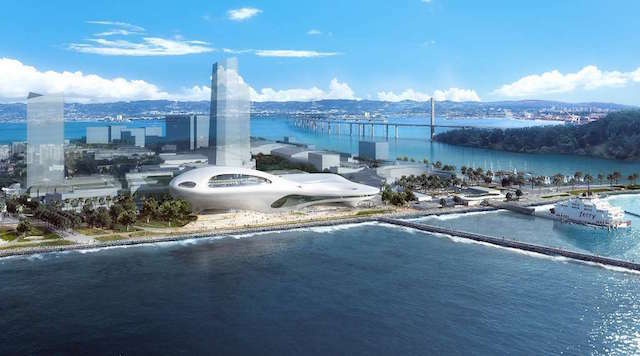 The Chronicle reports that while the final location of the museum is very much up in the air — Lucas is reportedly considering Los Angeles in addition to San Francisco — the new renderings have given city officials supporting the project a point around which to rally. It never seemed quite right that the man who brought us THX 1138 would house his collection of narrative art in a museum more reminiscent of times past than days ahead, and after his plan to build the museum in the Presidio was shot down and he announced he was taking both his art and his $700 million to Chicago, a new architect was brought on board. Interestingly, a design that evokes a cloud would not be out of place in San Francisco — according to the SFMOMA, the recently renovated and expnded museum was "was inspired by the waters and fog of the San Francisco Bay." The city has yet to approve the plan, with a determination about the museum's environmental impact still outstanding. And, even if officials here do approve it, Lucas may take the project elsewhere. According to the Chronicle, he is working simultaneously to seek approval from the city of LA and has reportedly yet to make a final decision — something he intends to do within two to four months. The LA Times takes a look at the Los Angeles renderings, which are similar in feel to the Treasure Island ones (although, of course, not on a island). If Treasure Island is selected as the museum site, the project is expected to take roughly three years after ground is first broken. Rendering of the proposed LA site from Lucas Museum Of Narrative Art via Chronicle. Rendering from Lucas Museum Of Narrative Art via Chronicle.